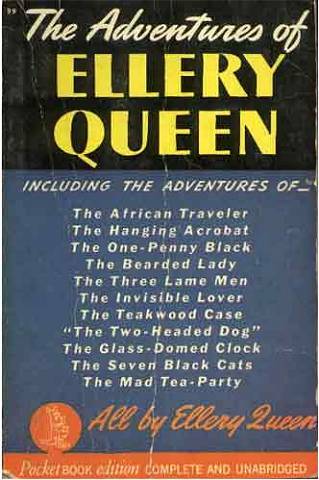 I had no idea that the Ellery Queen heirs still had to approve stories. Interesting and congratulations on another EQMM story! Dale, although I'm certain you would have made it interesting, I'm glad you didn't give us a synopsis of the transportation course. I thoroughly enjoyed today's story and certainly didn't expect the two words to be "Harry Potter." I don't recall that story either, but I'll check it out. Enjoy your trip to the Carolinas. Dale, Congratulations on the EQMM appearance. I'm searching for my December issue now. Against all odds I have found an internet connection in Nags Head! Fran -- Last year I tried to write a column about my course in Denver and after a few days I chucked the whole thing. You are right -- a synopsis of the story of transportation development in this country doesn't work here. Ironic (of course) that they are willing to pay a lot more for that story than for the ones that ARE worth telling and talking about here! That's a great story, Dale. Who could have seen that coming? Like Janice, I had no idea that you were in contact with the original EQ--wheels within wheels. For those that have not read Dale's latest entry--do so! It's excellent! Dale, sincere congratulations to you--and to David as well--for yet another EQMM story. Dale, this has all the characteristics of what I would call a deliciously convoluted small-world story, except that part of the world involved is in print rather than real life and some of the characters are fictional. Dale, enjoyed your latest story in EQMM. You've got some interesting connections. Dale, I forgot to Facebook you and say how much I enjoyed your latest E.Q. story in EQMM. "Harry Potter?!?" As we say on Facebook: OMG!!! Joe -- The pastiches I have written have never been collected here, although "The Book Case" appears in a Japanese anthology entitled "The Misadventures of Ellery Queen." For some time I have toyed with the idea of trying to put together an English language anthology of Ellery pastiches -- besides the three I have written thus far there are others by Mike Nevins, Ed Hoch and Jon Breen (as well as others) that could fill a volume. Particularly with the advent of epublication this might be possible in the future. Until then the only way to secure copies of "The Book Case," or "The Mad Hatter's Riddle" is by purchasing the EQMM issues they appeared in directly from Dell. There is a back issue option on the EQMM web page, though I have no idea whether the relevant issues are in fact available.